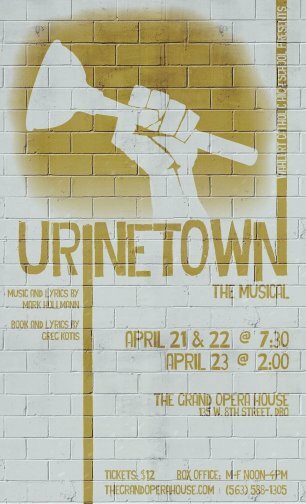 Urinetown: The Musical is a satirical comedy musical that premiered in 2001, with music by Mark Hollmann, lyrics by Hollmann and Greg Kotis, and book by Kotis. It satirizes the legal system, capitalism, social irresponsibility, populism, bureaucracy, corporate mismanagement, and municipal politics. The show also parodies musicals such as The Threepenny Opera, The Cradle Will Rock and Les Misérables, and the Broadway musical itself as a form. The characters of Bobby Strong and Hope Cladwell were included on New York Theatre Monthly's list of "The 100 Greatest Roles in Musical Theatre".